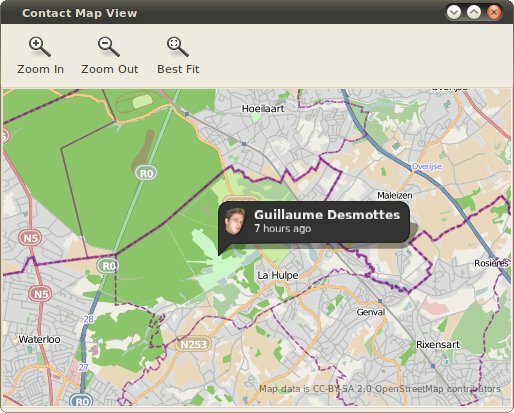 I just uploaded the second release of Azimuth, the Maemo application allowing to publish your location to your contacts. Lot of cool stuff in this new release! Thanks to Alban Crequy Azimuth gained a control panel menu. It can be used to easily enable/disable publishing so you can now safely install Azimuth even if you don't want to always publish your location (be aware that this option is turned on by default though). We also added an option to reduce the accuracy of the published position if you don't want to publish your exact location to your contacts. There is a third button than can be used to quickly turn the GPS on/off but be aware that letting the GPS always running will drain your battery. Last but not least, Azimuth now has its own icon! Anthony Carré (yeKcim) designed a great icon which fit pretty well with the existing Maemo icons. I hope you'll like it as much as I do. Anthony is well known for his graphic work on the Wormux game. Here is a small project I've been working on in my copious spare time. The Nokia N900 is a great device but I felt kinda frustrated not being able to publish my location to my contacts in a way that Empathy can display it. Good news is the N900 uses Telepathy so that's something that can easily be fixed. Here comes Azimuth a small daemon publishing your location using the Telepathy Location interface. The interface is only implemented in telepathy-gabble at the moment. That means that your Jabber server has to support Pubsub to be able to publish. Unfortunately, Google Talk servers don't; see the Telepathy FAQ for details. I just uploaded the first version of Azimuth to Extras-devel (thanks Bigon for the package!) so you should be able to easily install it. This is my first Maemo application so I kept it pretty simple for now. Azimuth doesn't enable the GPS itself so you have to start another application using the GPS (as OVI Maps or Map Buddy for example) to publish. Reboot your N900 (the package doesn't start it automatically; suggestions about how to fix that properly are welcome). Be aware that once installed Azimuth will always publish your location when an application is using the GPS and your IM accounts are connected! Add UI (probably a settings widget) to easily enable/disable publishing. Add an option to reduce location accuracy for privacy reasons. Allow using the Cell to get a position? If you have more artistic skills than I have, an icon would be much appreciated.